To celebrate the on-screen release of the new James Bond film, SPECTRE, the House of Bollinger – which has been allied with the world’s most famous spy since 1979 – has created a unique object expressing the ultimate degree of refinement and excellence so beloved of 007. 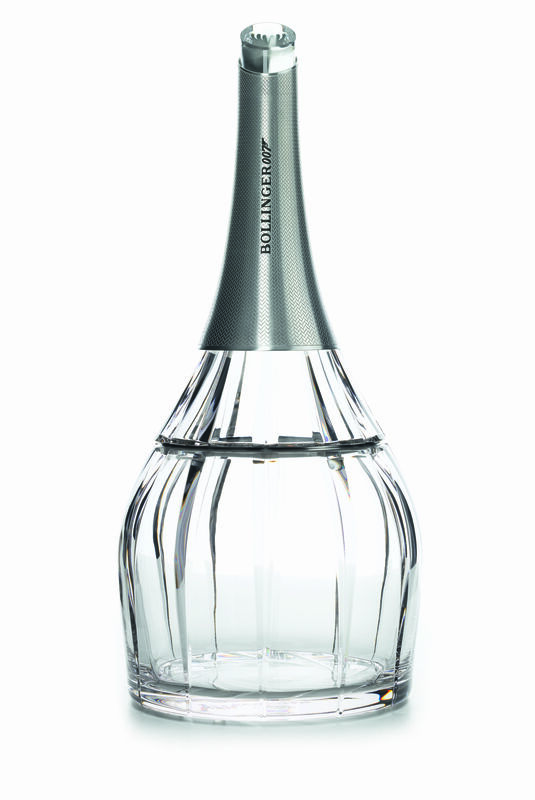 The Bollinger Crystal Set was created and designed by designer Eric Berthès, who wanted to showcase the nectar that is Bollinger R.D. 1988. A rare, unequalled champagne, Bollinger R.D. is matured for an exceptionally long time on its lees to give an incredibly aromatic complexity and long finish. The magnum of Bollinger R.D. 1988 is beautifully enhanced and encased in its Saint-Louis crystal case: its base echos 007’s iconic gun barrel, like a fingerprint, while the neck label is made of metal and features the BOLLINGER 007 signature, while a cabochon engraved with the octopus motif of the Spectre logo finishes off this exemplary piece. A collector’s object, this fabulous Bollinger SPECTRE Crystal Set has only been produced in 307 numbered pieces. There will be only one unit allocated to Ireland, which will be available exclusively in Brown Thomas Dublin for €5,007. R.D. – meaning Récemment Dégorgé or “Recently Disgorged” – is unique, with no equivalent amongst other champagne Houses. A rare cuvée straight from Madame Bollinger’s bold imagination, Bollinger R.D. heralded a small revolution in the world of champagne when the 1952 audience was revealed to a global audience in 1961. Spending at least 8 years on the lees, and many years in bottle after that, R.D. offers an unparalleled insight into the complexity of Champagne. Vintages are rare and are produced in limited amounts, emphasizing their importance: entirely crafted by hand, using traditional skills, this champagne offers the ultimate luxury of unparalleled enjoyment. The 1988 Vintage of Bollinger R.D. Founded in Lorraine in 1586 and becoming the leading crystalworks in Continental Europe in 1781, Saint-Louis – which now belongs to the Hermès group – has successfully preserved its unique know-how. In their workshops, its master glassblowers keep alive the art of hand-blown crystal, continuing to excel above all in the art of cutting, which is a true hallmark of this great Lorraine crystalworks.